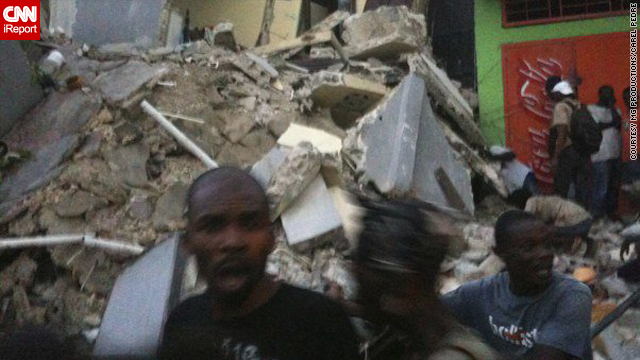 An earthquake in Haiti has reportedly destroyed numerous buildings in the capital Port-au-Prince. NEW: Tweets: "an 8 story building behind me is rubble," "the palace..it is destroyed"
(CNN) -- CNN is monitoring tweets and other messages from people in Haiti and reports from those who said they have been in touch with friends and family. CNN has not been able to able to verify this material. "its crazy. we can here people wailing and crying. we know a lot of big buildings have fallen. we watched the mountain above the orphanage split. i have never experienced anything like this before. all of the nannies and kids are sitting out in the middle of our compound. a neighbor has already come over for medical help. i don't have words to express." -- Commentor relating details from sister-in-law in Jacmel, Haiti on the south coast at the Hands and Feet Mission/Children's Village. "Just got news that one of nannies,Francines school in Jacmel fell. She is injured but prayfor her. Many of her classmates are dead! She is at her moms house next door tonight. We also heardthat thehospital in Petionville (PAP) also collasped." -- Commentor Drex Stuart of the Hands & Feet Mission in Jacmel, Haiti.